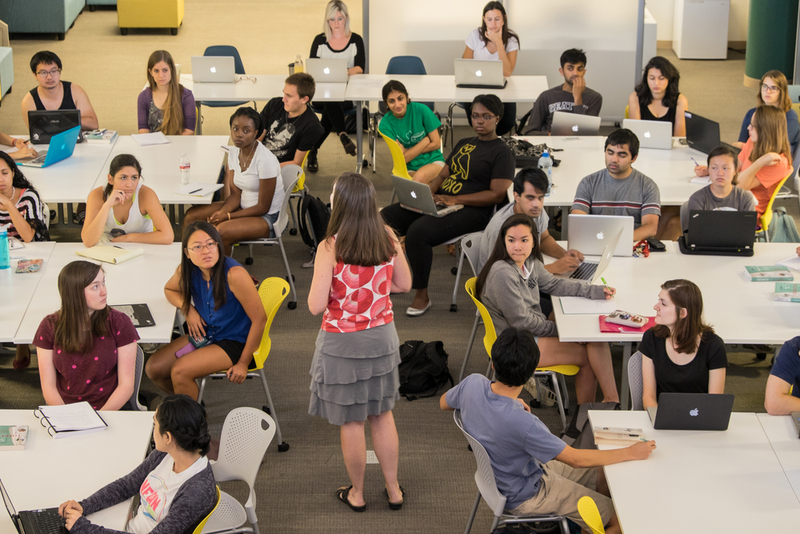 Each semester, Rice faculty apply to teach in our experimental classroom, Herring 129. The classroom space has moveable seating and tables that can be arranged in numerous configurations, depending on your pedagogical needs (for the semester or for a particular day). While there is seating for up to fifty students, the space is best suited to classes enrolling between ten to forty students. Want to lecture one day? The classroom can be set up with tables and seats facing the large, permanent screen. Want to have active learning groups one day? The classroom can be arranged with tables configured to accommodate groups as small as two and as large as twenty-five. Want students to have group discussions in comfortable, modular seating? Allow them to spread out on the couches. Want to have your department’s TAs watch a class session? Have them sit in the viewing gallery above on the second floor. The experimental classroom’s possibilities are limited only by your imagination. Any Rice faculty member, tenure or non-tenure-track, from any discipline, is eligible to apply. You will complete the online form available on this page. The deadline to apply for the fall semester is typically early February and the deadline for the spring semester is typically late September. An email with exact dates and requirements for application will be sent to all faculty by the current Chair of the Faculty Fellows. We need to know the course name and title, a description of the course, your preferred days/times to teach the course, and why you think this flexible space would benefit your course pedagogically. Note that scheduling of the Herring, 129 classroom is not available through the Registrar’s office. Currently, the room is only available through this application process. How will applicants be selected to teach in the space? Applications will be reviewed by a committee of CTE faculty fellows and CTE staff. Strong applications will provide a good rationale for why a flexible space would enhance your course. Please review our guidelines for faculty, available here. Can I see the classroom before I apply? Sure! Please contact Josh Eyler at jeyler@rice.edu or x2732 to arrange a visit. Floorplans are available for viewing here. Applications for Fall 2019 are currently being accepted. Deadline for applications in February 20th.